Happy Christmas Eve. 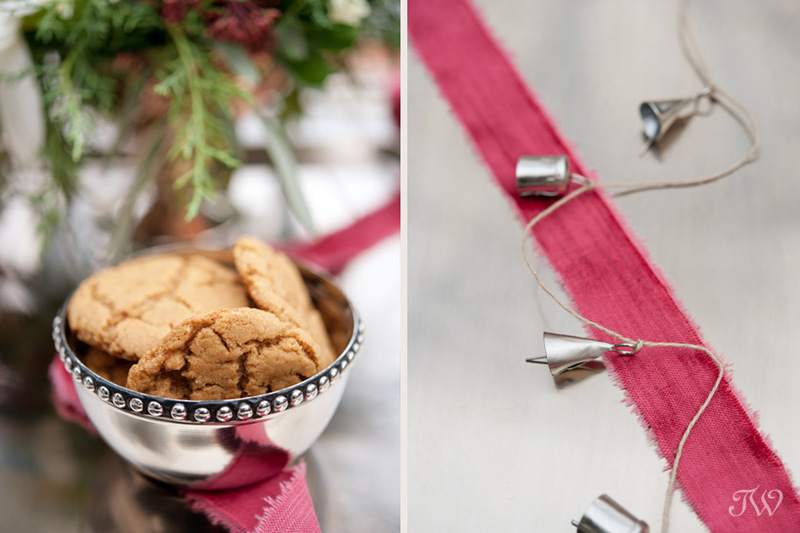 I’m not sure how you’re celebrating tonight but I thought I would share a series that I photographed with Sharon from Naturally Chic for couples and suggestions for creating new Christmas traditions. 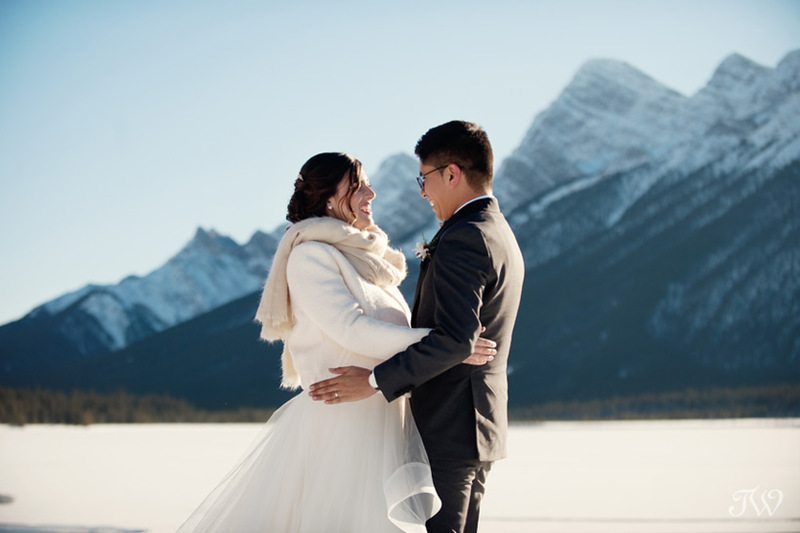 The series has been featured on the wedding and lifestyle blog Canadian Mountain Chic (part one, two and three ), but tonight I’m sharing a few of the highlights for spending Christmas in Banff. 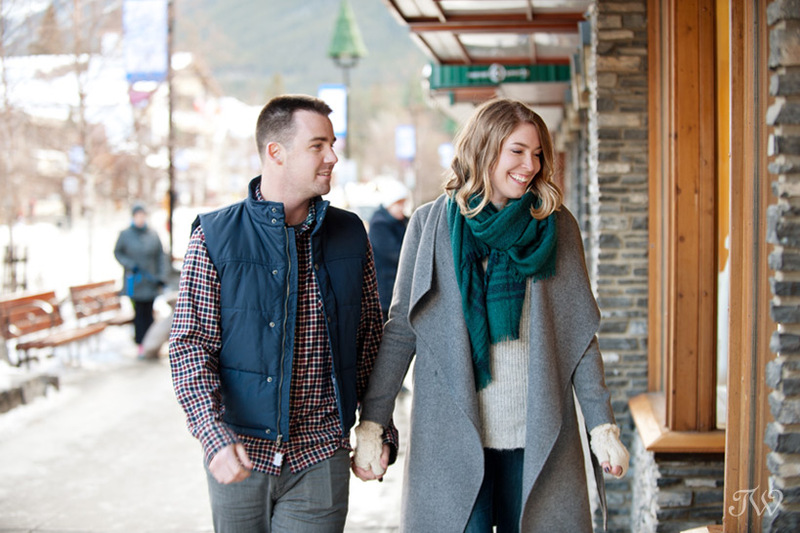 We spent the day in Banff with newlyweds Kari and Derek Owen, as they took in the season, mountain-style. Lace up your skates and take a turn around the rink with your love. 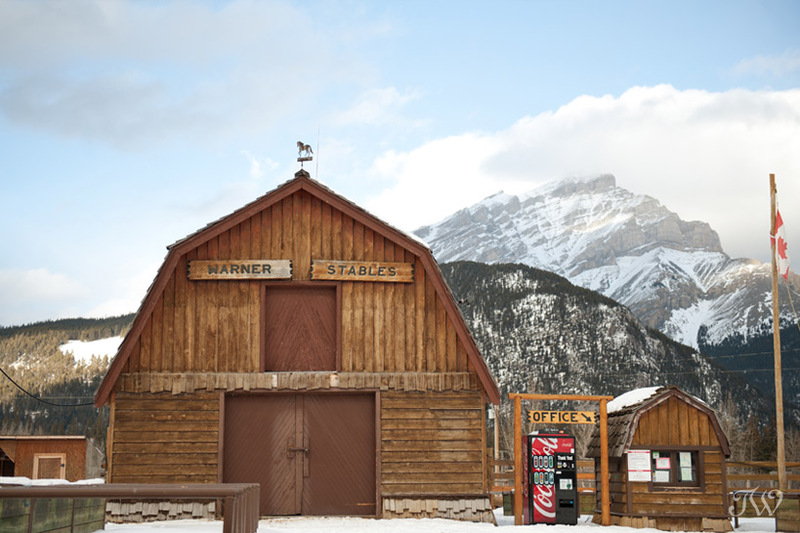 The Town of Banff website lists the best outdoor rinks. 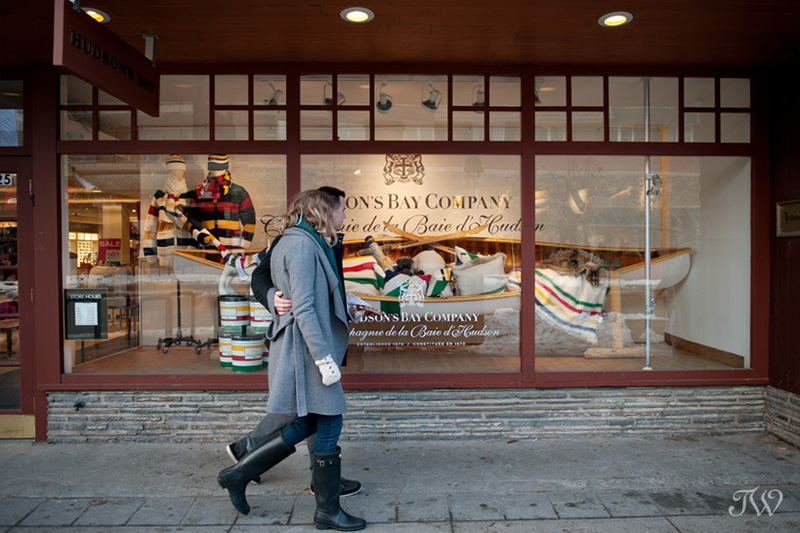 What activity could be more quintessentially Christmas than a sleigh ride? 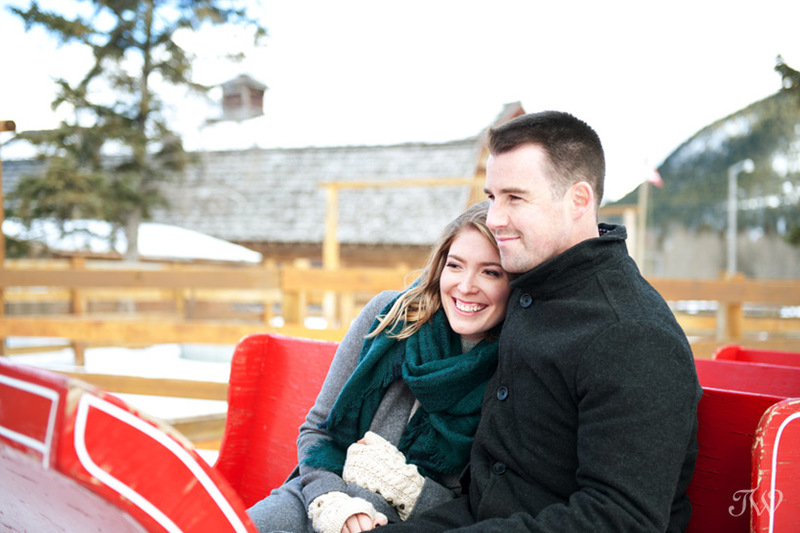 Warner Stables in Banff offers romantic sleigh rides for couples and for larger groups. 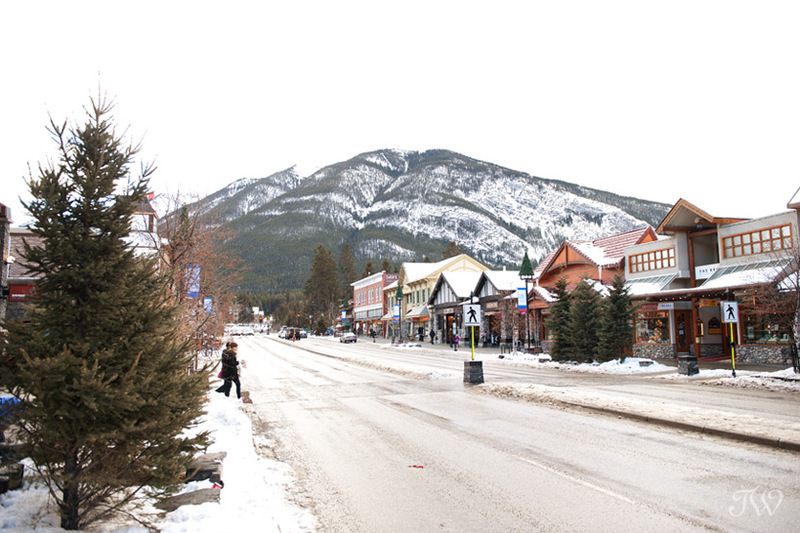 A trip to Banff wouldn’t be the same without a stroll down Banff Avenue. 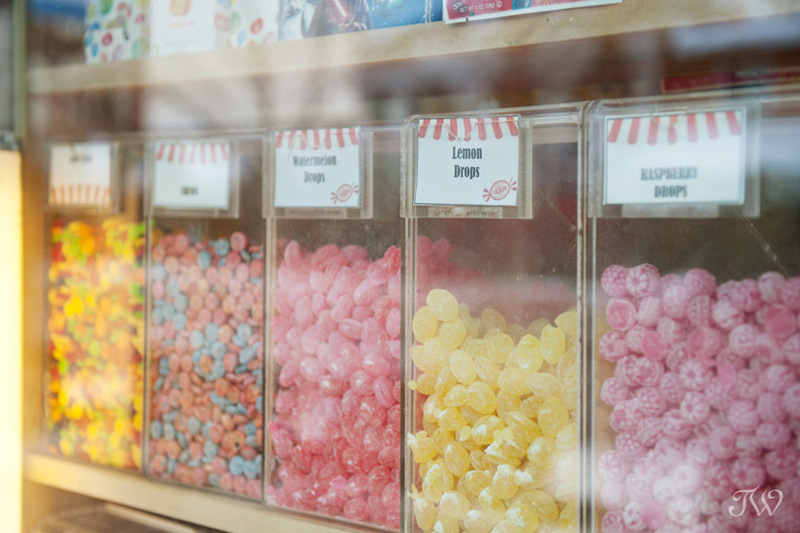 Kari and Derek stopped for tasty treats at a few of their favourite shops. 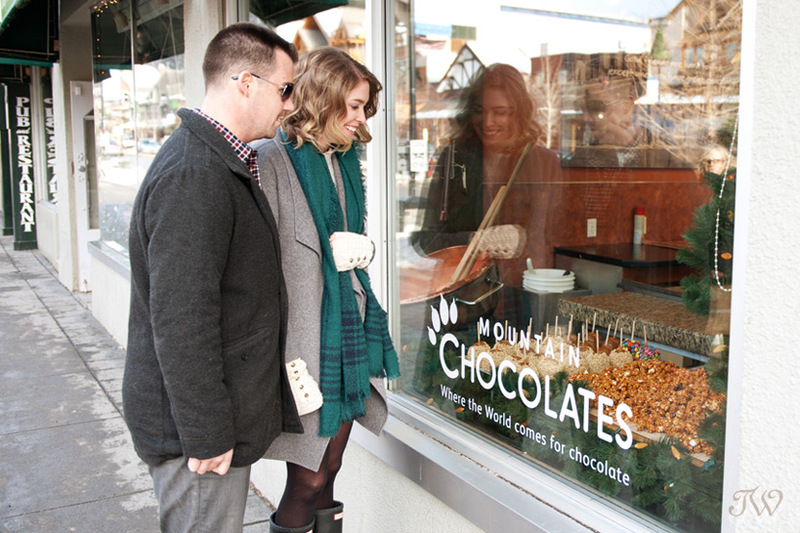 Sample a “bear claw” from Mountain Chocolates. 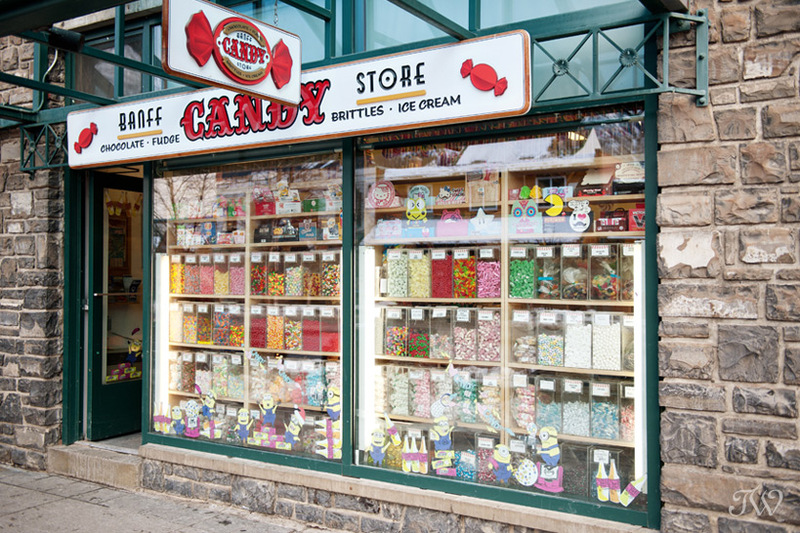 The Banff Candy Store, is a family favourite. 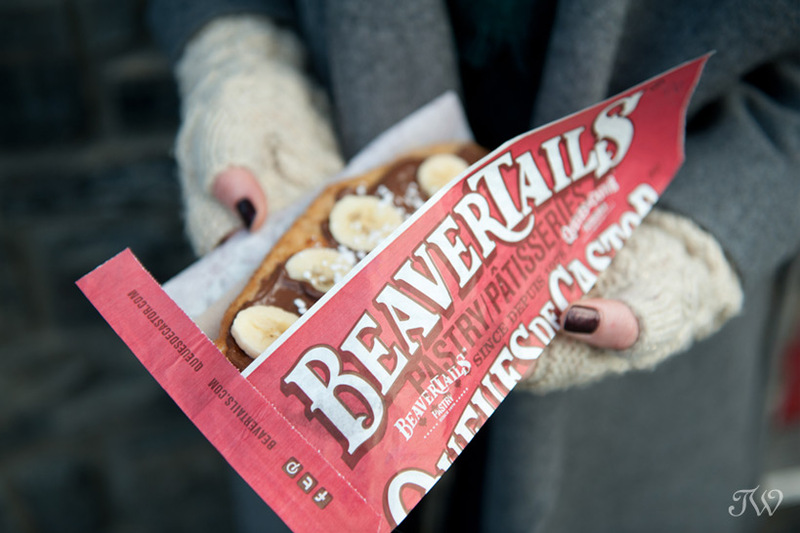 Satisfy your sweet tooth at BeaverTails. Kari and Derek chose banana and nutella. 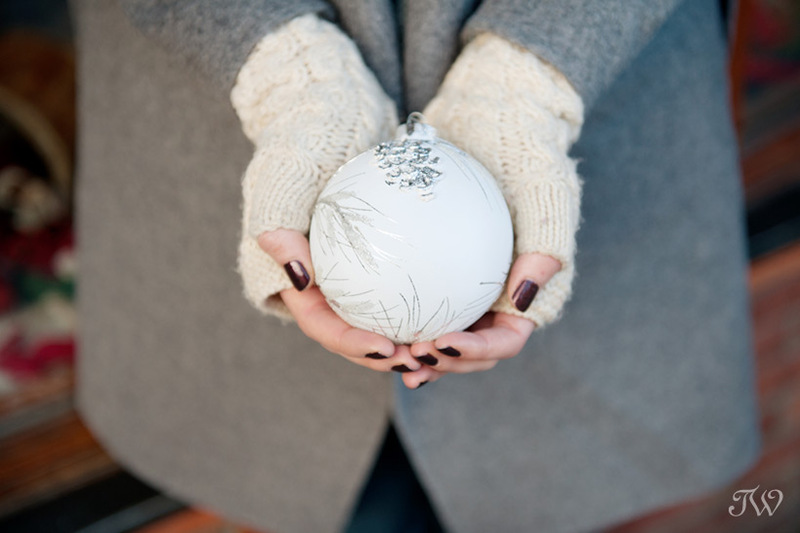 Make an annual stop at The Spirit of Christmas to select a tree ornament together. 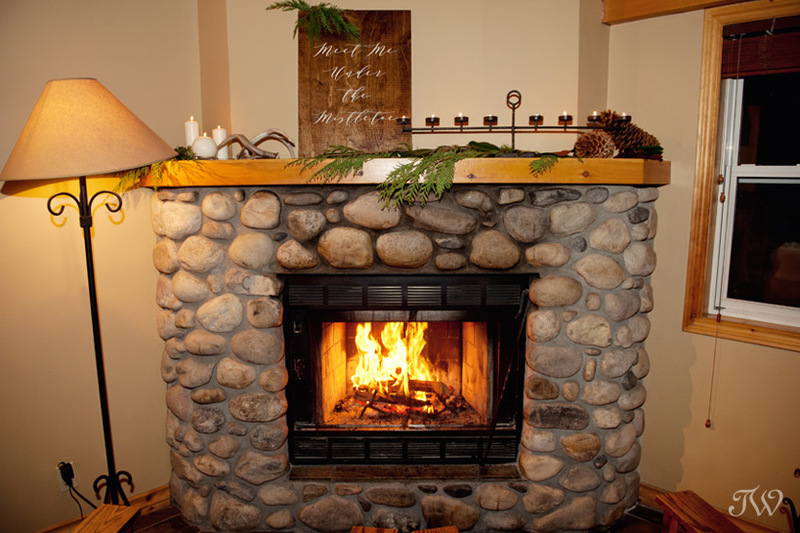 Sharon from Naturally Chic set a romantic table for two in front of a roaring fire in the Wapiti Room at Buffalo Mountain Lodge. 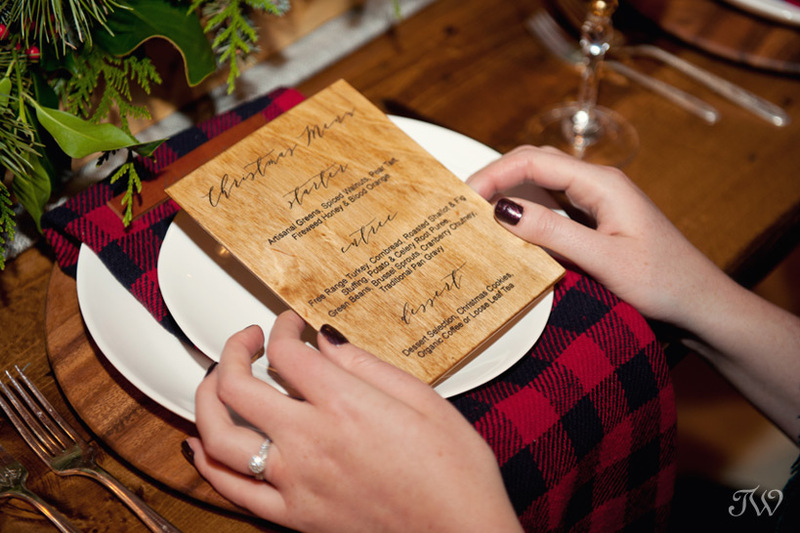 See all of the details, including handcrafted wooden menus, on Canadian Mountain Chic. 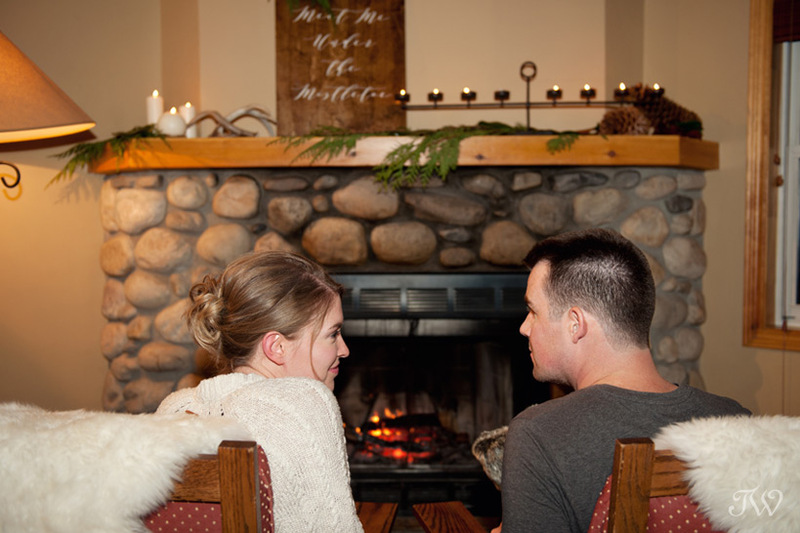 Kari and Derek settled in for a long winter’s nap at Buffalo Mountain Lodge, located on Tunnel Mountain. 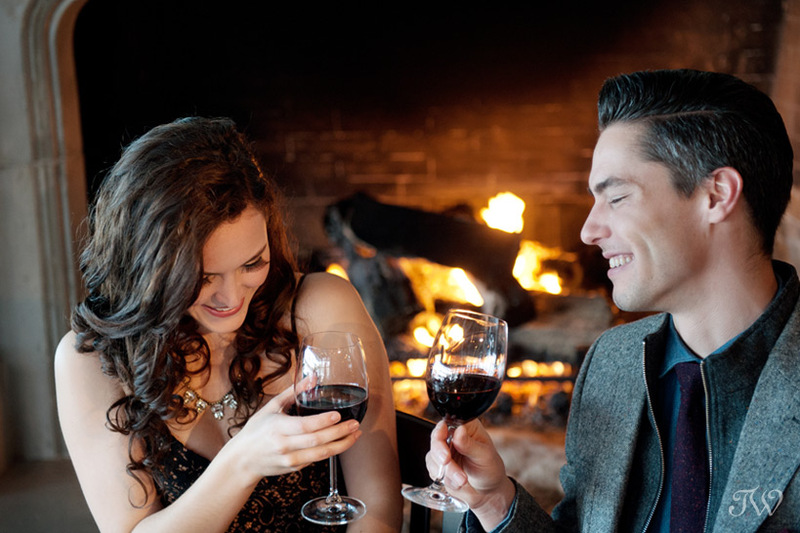 This is one of the most romantic holiday traditions to start! It’s pretty simple, you write a note to your partner telling them how special they are and what they’ve meant to you throughout the year. You then share the letters and read them on Christmas Eve. 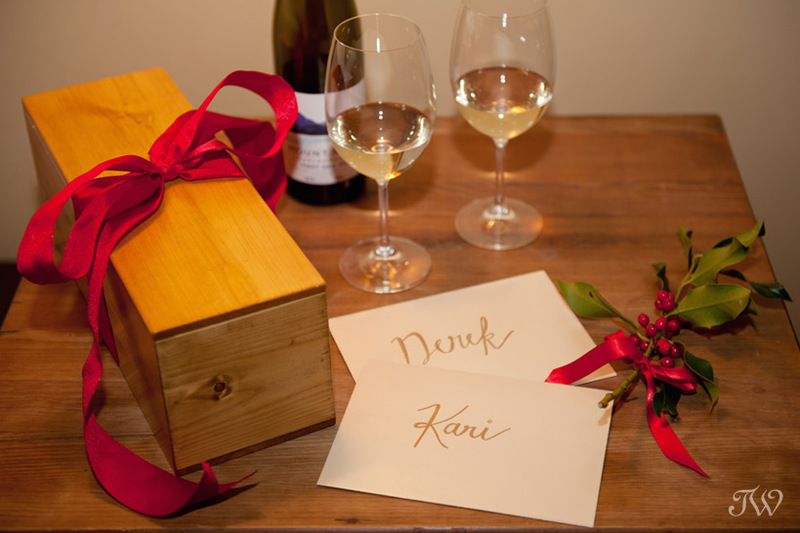 A fun twist, is to seal your love letters in a wood box with a bottle of wine. Then, you take the letters out and read them on the following Christmas over a bottle of bubbly. It’s a great way to reminisce the year that was and to express your heartfelt appreciation for one another! 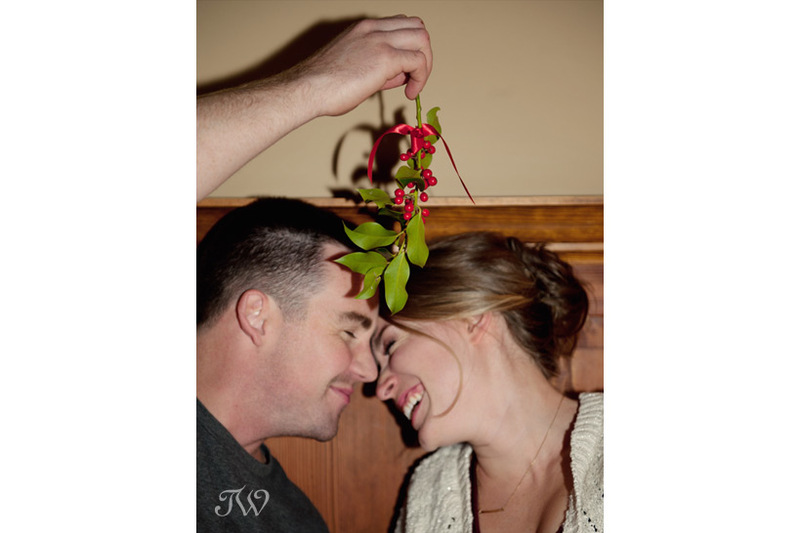 Sweeten the evening with a little mistletoe. Christmas wouldn’t be Christmas without a classic holiday film. Kari and Derek settled in front of the fire to exchange Christmas stockings filled with goodies from several local boutiques. 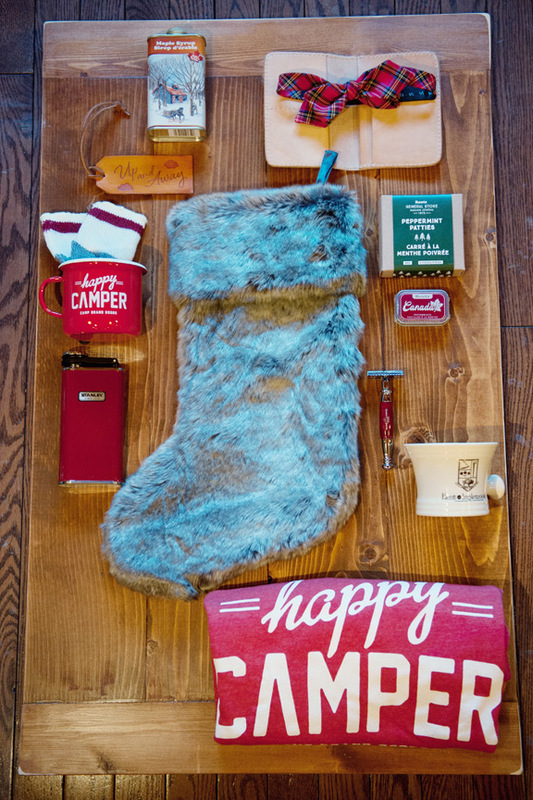 See this post for stocking stuffer suggestions for him and for her. 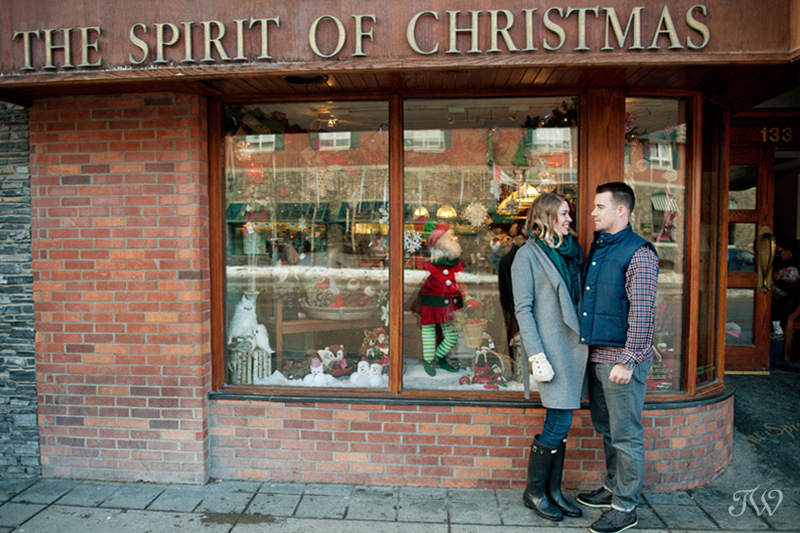 Be sure to stop over at Canadian Mountain Chic for the full scoop and loads of Christmas inspiration for couples young and old (part one, two and three). 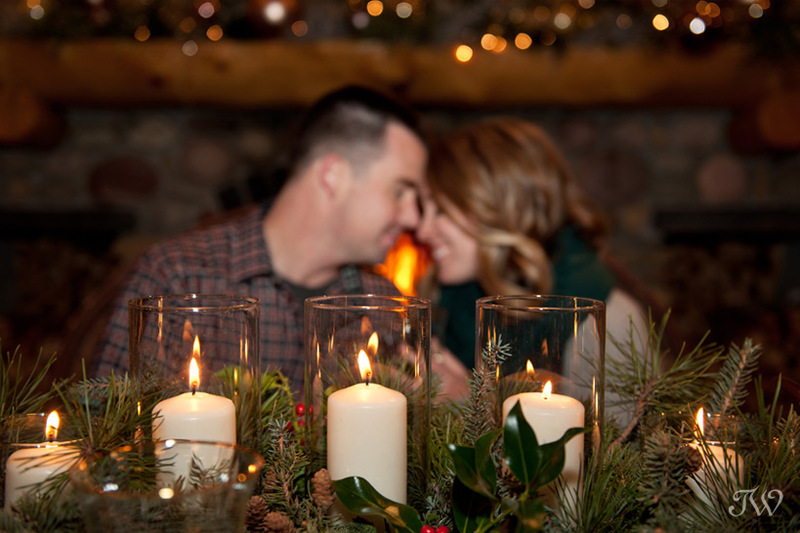 Holiday hugs to Kari and Derek, our real life couple. 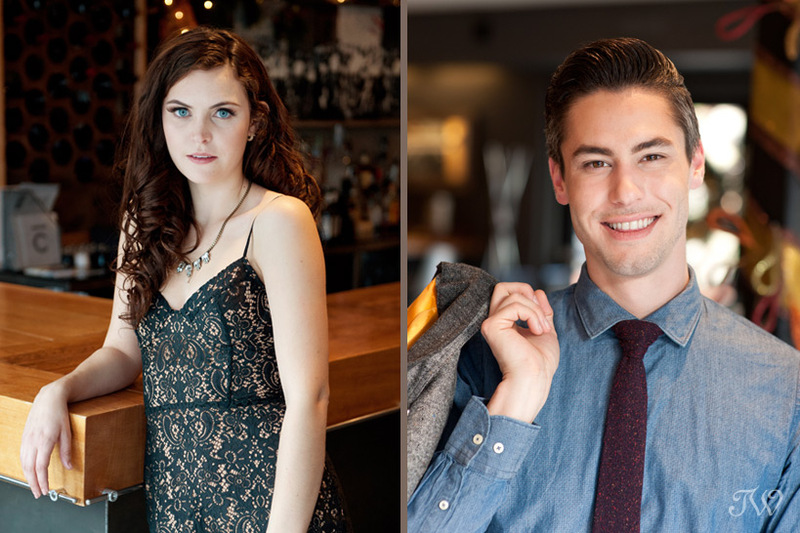 I’m not gonna lie, I’m pretty smitten with this shoot. 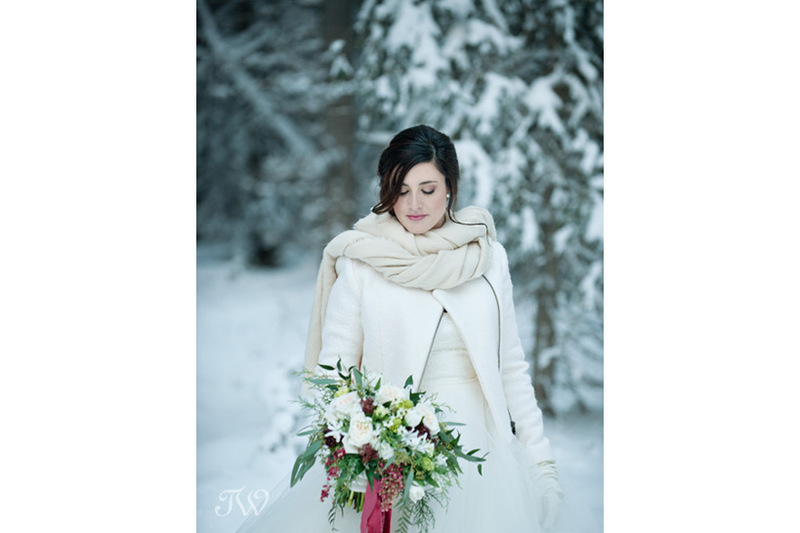 Janelle from Flowers by Janie and I had planned a styled wedding shoot to feature some of her beautiful winter blooms but this project had a unique twist. 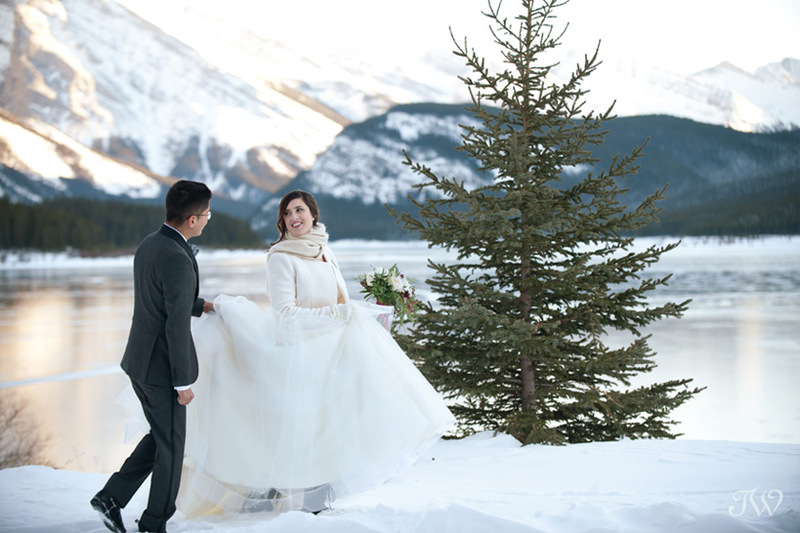 Janelle and her husband Oscar were the bride and groom and renewed their vows at Spray Lakes to celebrate their fifth wedding anniversary. 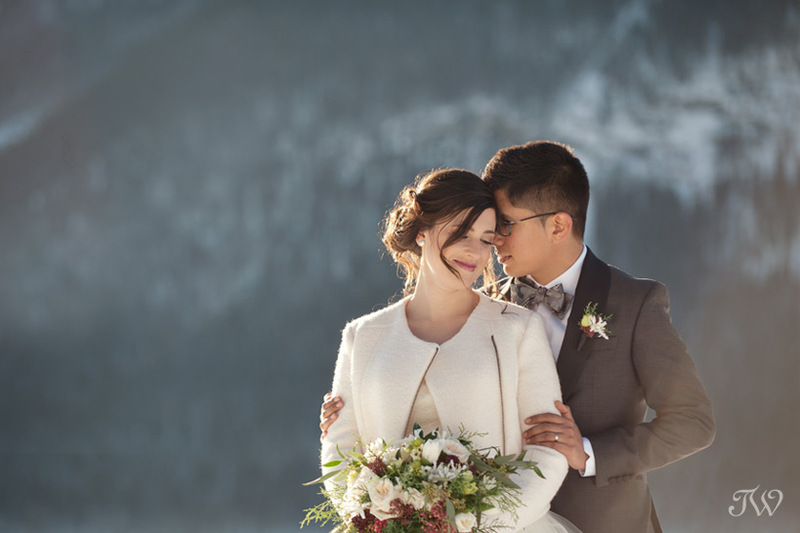 They share a love of the mountains so choosing The Rockies as a backdrop was a no-brainer. As we were planning, Janelle mentioned how watching “It’s a Wonderful Life” is an annual tradition for them. 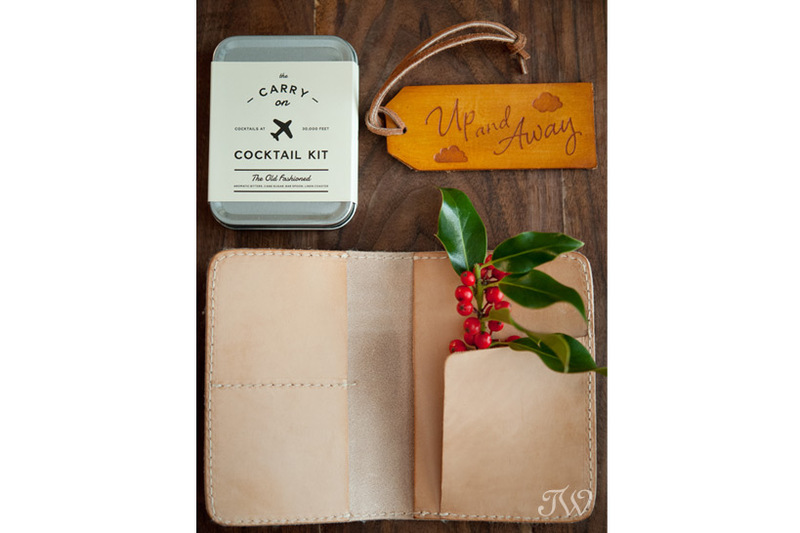 For the personal touch, we included a hint of the holidays and a nod to the classic Christmas film. Our love story began in the Andes. We met and were married in La Paz, Bolivia, 5 years ago. 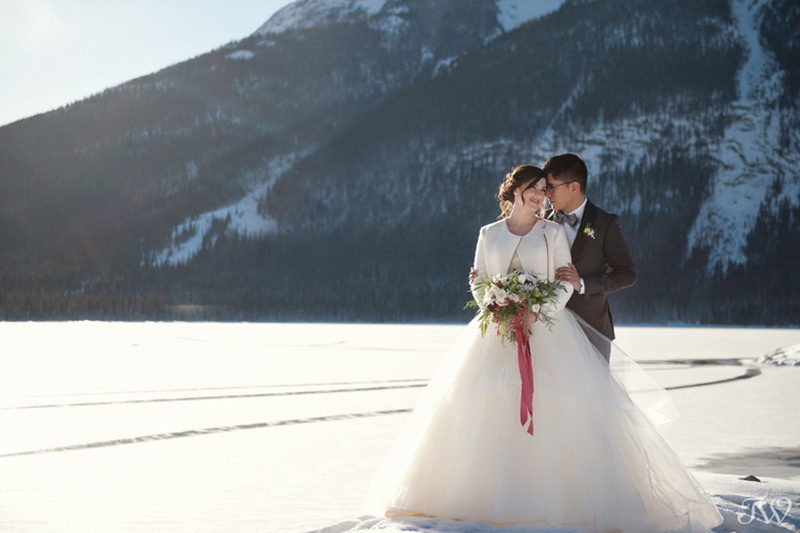 It was very symbolic to be able to renew our vows at Spray Lakes in the Rockies, near our new home in Calgary. The day included elements from “It’s a Wonderful Life”, our favorite Christmas movie. We enjoy the romance between the lead characters, George and Mary, including their honeymoon in the run down home they will fix up. They don’t have much money but love is more important to them than material possessions. 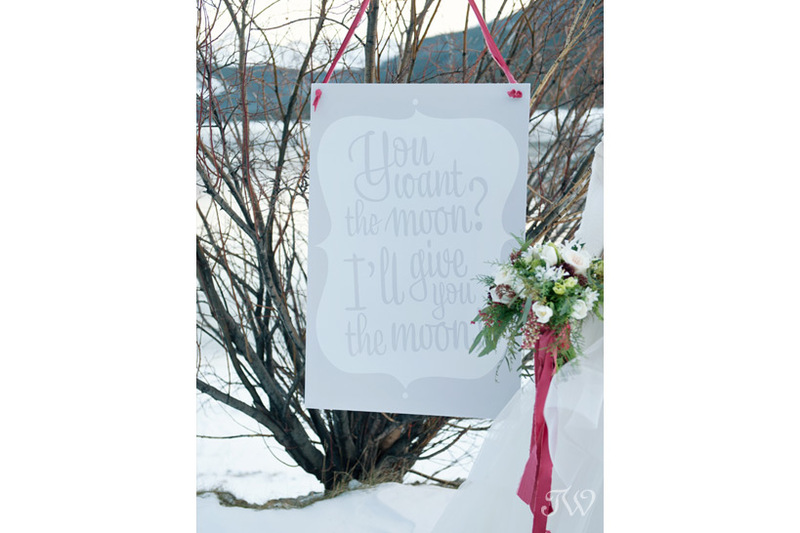 And George’s proposal is so romantic…”I’ll give you the moon, Mary”. 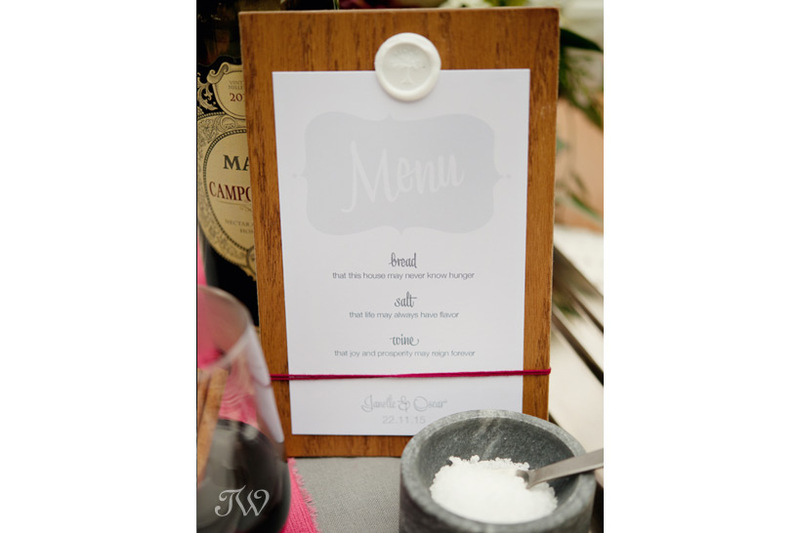 A big thank you to all of the vendors who made this day so special for Janelle & Oscar! It may be Monday morning but it’s the perfect time for something pretty. 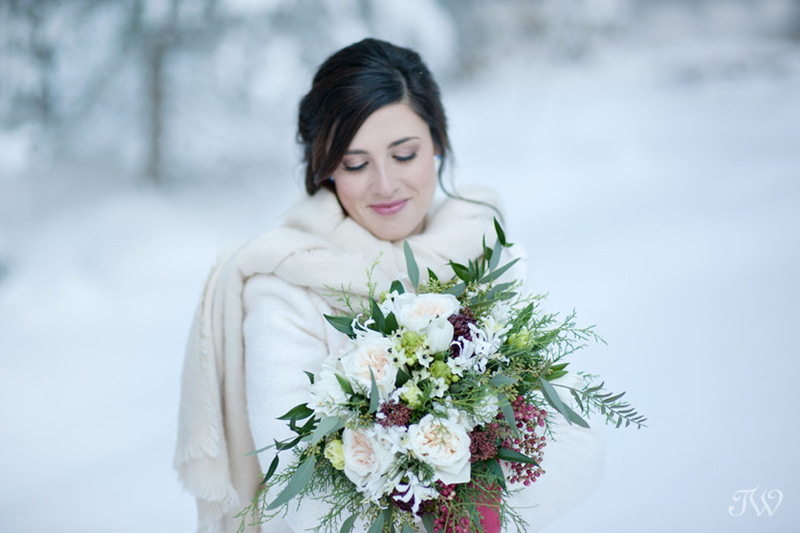 Janelle from Flowers by Janie is back with our “bloom of the week” series and plenty of winter wedding ideas. 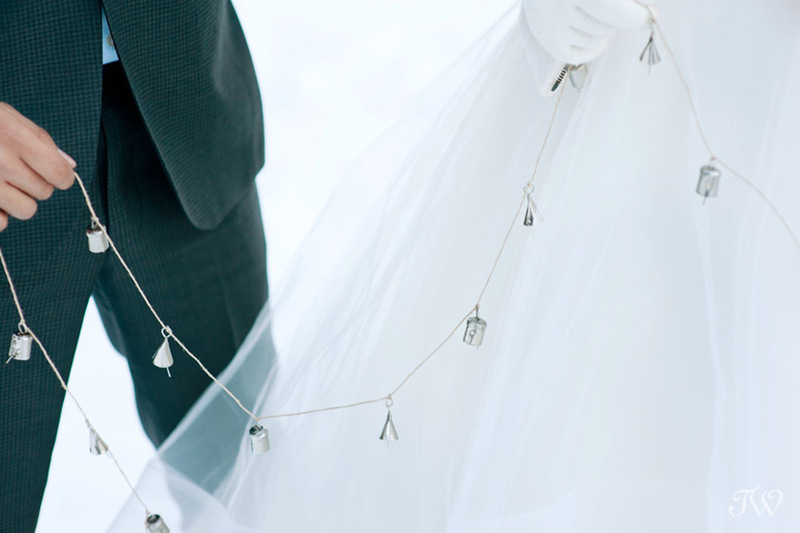 Today we’re featuring the Nerine Lily so if you’re a winter bride, pay close attention. The Nerine Lily is native to South America and is a member of the Amaryllidaceae family. It is not a true lily but rather looks like a smaller versions of the Amaryllis flower with their small florets at the top of a leafless stem. The flowers come more commonly in white and pink but are also available in deep red. They grow well in rocky and arid habitats and dislike humid climates. They can be found year round as a cut flower but bloom most often in early winter. 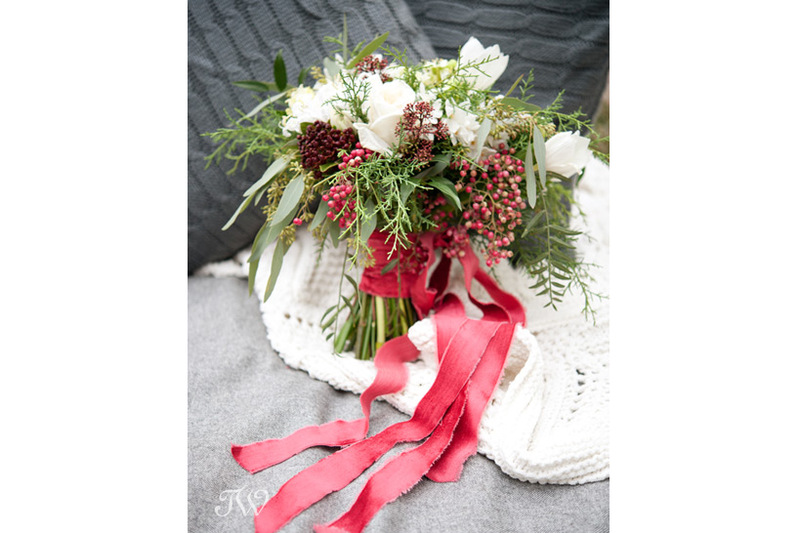 The flowers are often used in Oriental-style floral design but also look beautiful in wedding bouquets as well as wedding boutonnieres and corsage. 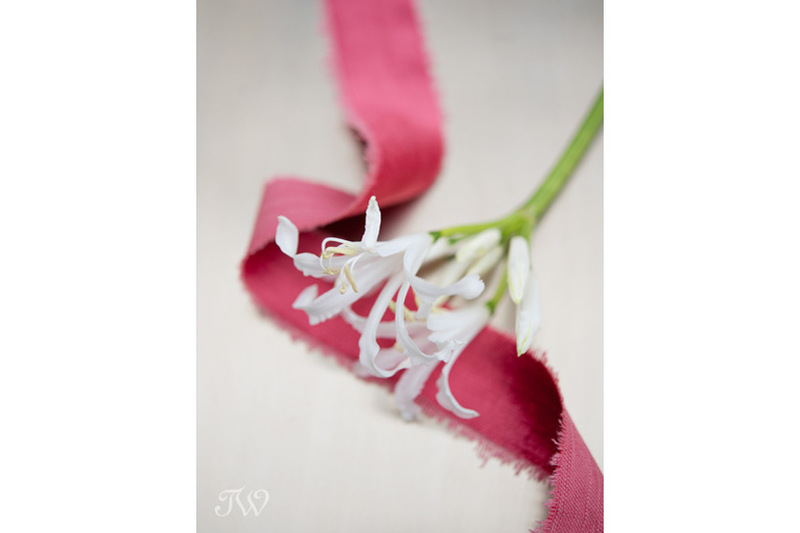 Here’s Janelle’s post on Paperwhites, if you’d like to see. In hopes that St. Nicholas soon would be there”. 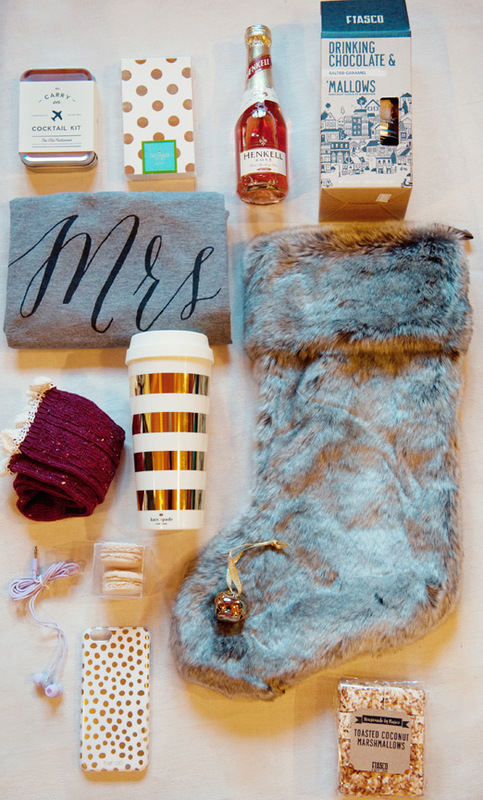 Christmas stockings are proof that good things really do come in small packages. 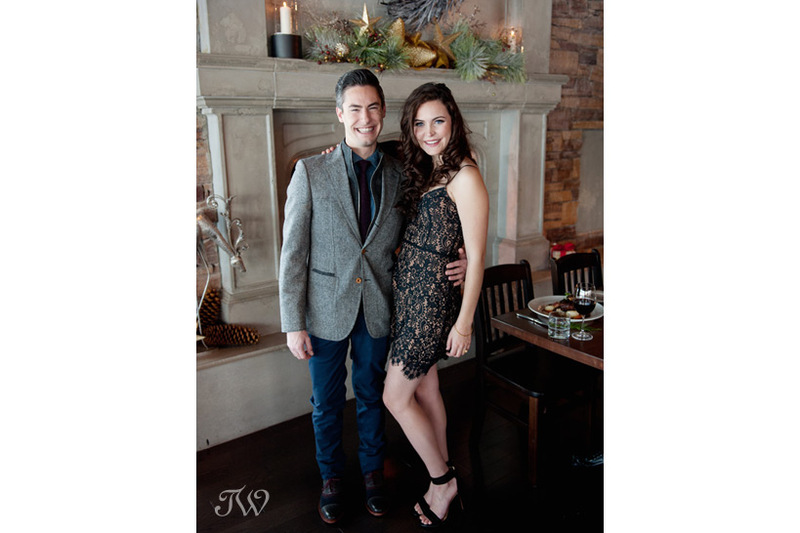 Leading up to Christmas, I photographed a series with Naturally Chic on couples and ideas for starting new Christmas traditions. Exchanging a stocking is the perfect tradition that allows you to recreate some of that childhood magic. The sight of a stocking full to the brim with their favorite things is a sure way to make your sweetie smile on Christmas morning. 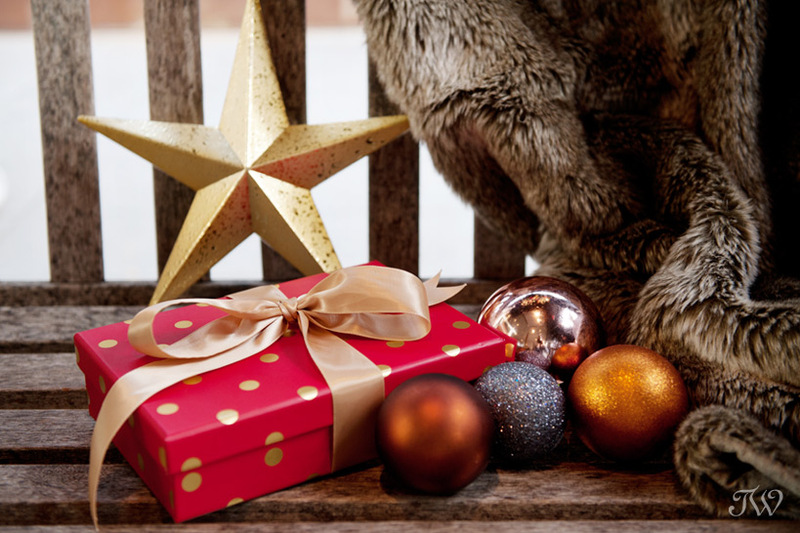 If you like the idea but don’t know where to start shopping in Calgary, Sharon from Naturally Chic has compiled a list of stocking stuffers “for her” and “for him” that are sure to get you a kiss or two under the mistletoe. 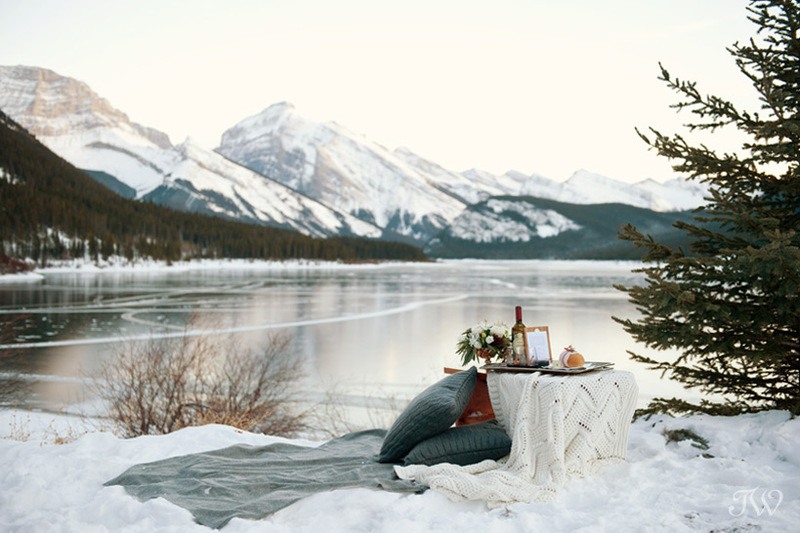 The Christmas Tradition series has been featured on the wedding and lifestyle blog, Canadian Mountain Chic. See part one, two, three. 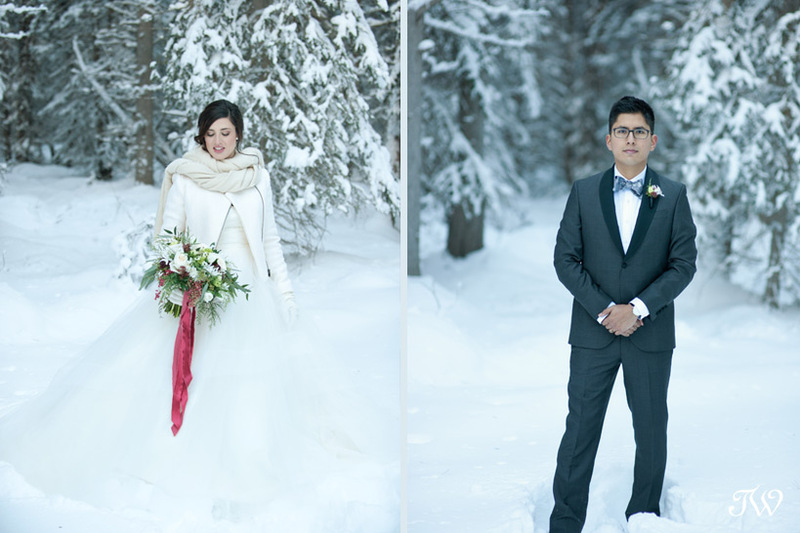 Winter is definitely upon us and if you’re a bride, there’s no end to the winter wedding possibilities. 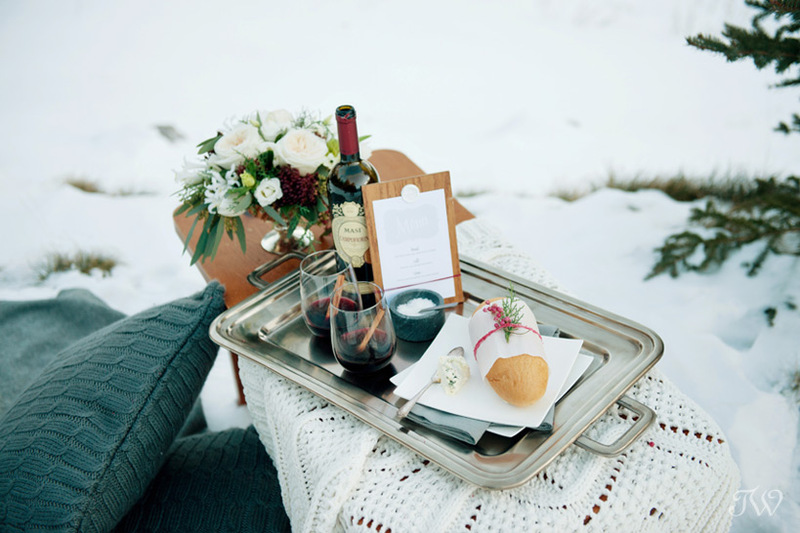 Between the snowy landscapes, the hot chocolate wedding favours and the unique flower offerings, winter weddings can have a magical feel all their own. Janelle from Flowers by Janie and I are collaborating on another “bloom of the week” series and we’re kicking things off with one of my personal holiday favourites, the Paperwhite (I have one blooming in my back porch at the moment). 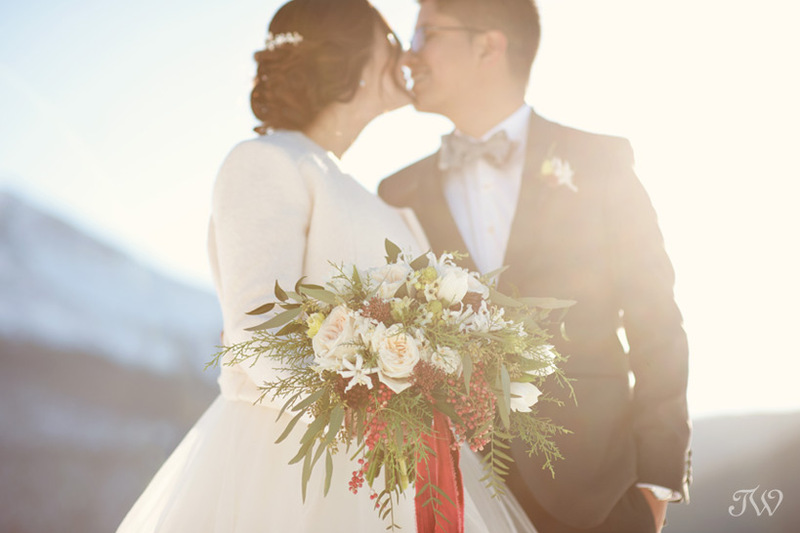 Janelle tells us why Paperwhites are a lovely addition to a bouquet for a winter bride. Paperwhite Narcissus are a member of the daffodil family. They are the most fragrant of the daffodil family and have small white star shaped clusters which are smaller and more delicate than the yellow daffodil. 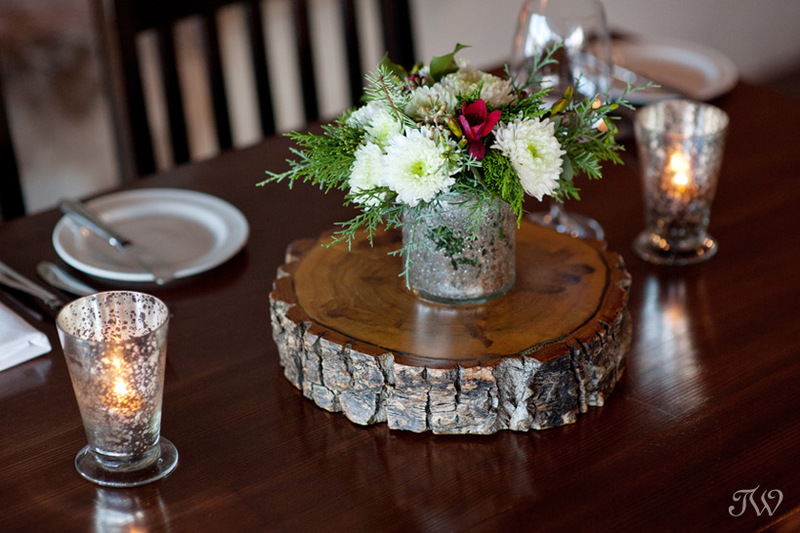 They generally have a short growing season and bloom between Thanksgiving and Christmas. Like the daffodil that excrete a sap like liquid from their stems which is harmful to other flowers. 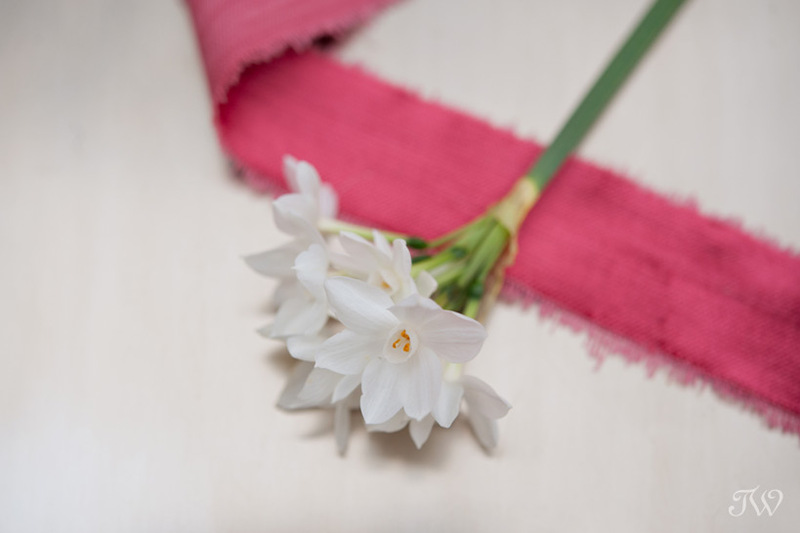 If mixing these flowers with other blooms it is highly recommended to cut the Paperwhites and set them in another vase for 4-6 hours before mixing them with other blooms. It is important that once with other blooms they are not recut. 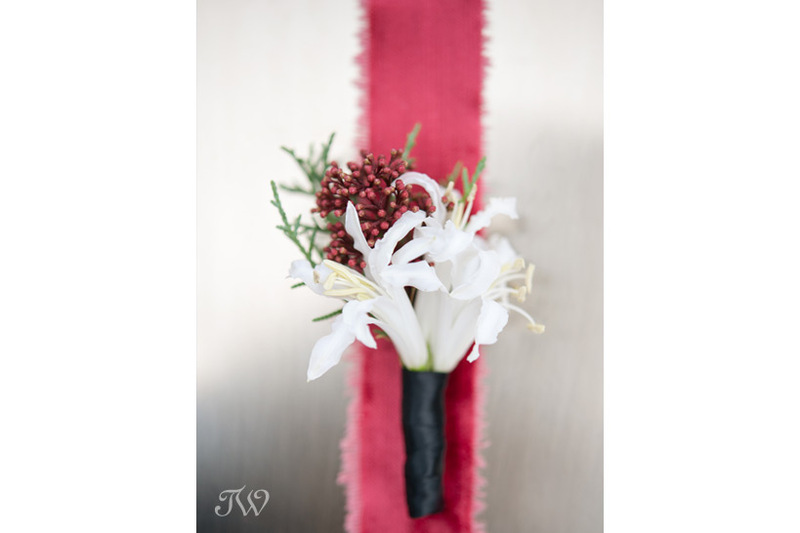 Paperwhites add texture and fragrance to sweet winter wedding bouquets! 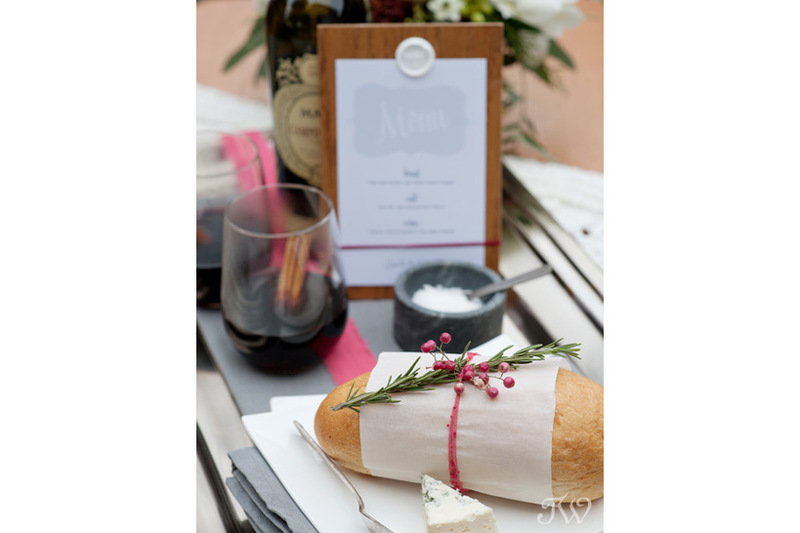 If you’d like a little more detail on these fragrant flowers, pop over to Janelle’s blog for the expert’s point of view. 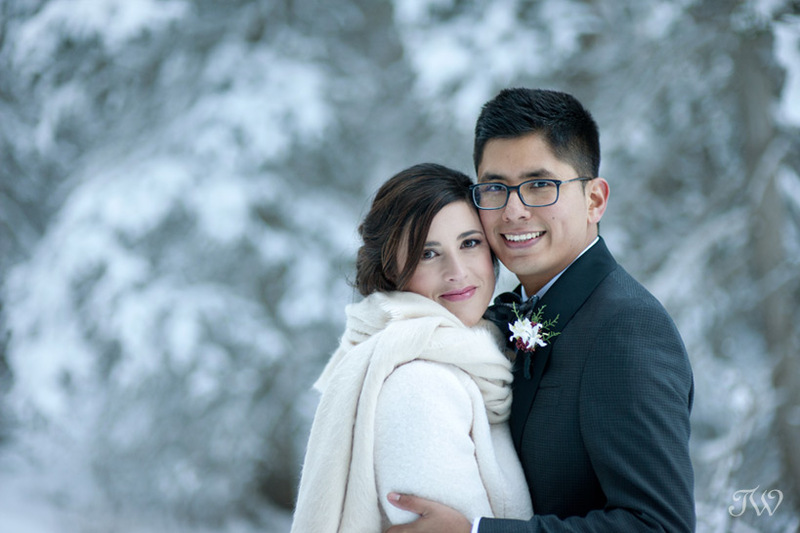 Janelle and her hubby Oscar are winter wedding experts. 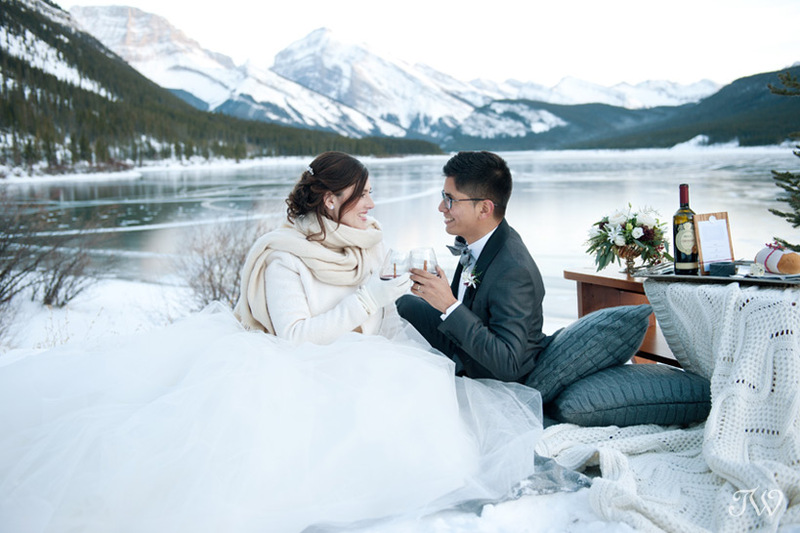 They just celebrated their 5 year anniversary with a winter vow renewal at Spray Lakes. 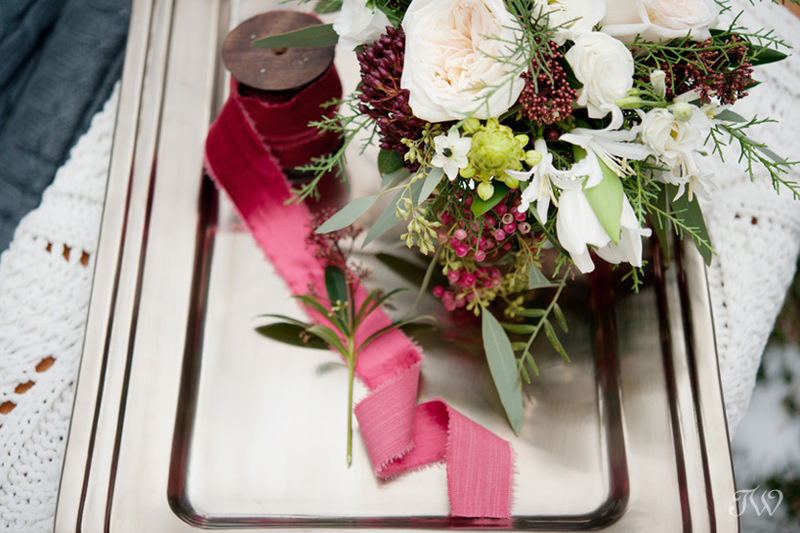 Her bouquet was romantic and fabulous and it contained…you guessed it, Paperwhites. 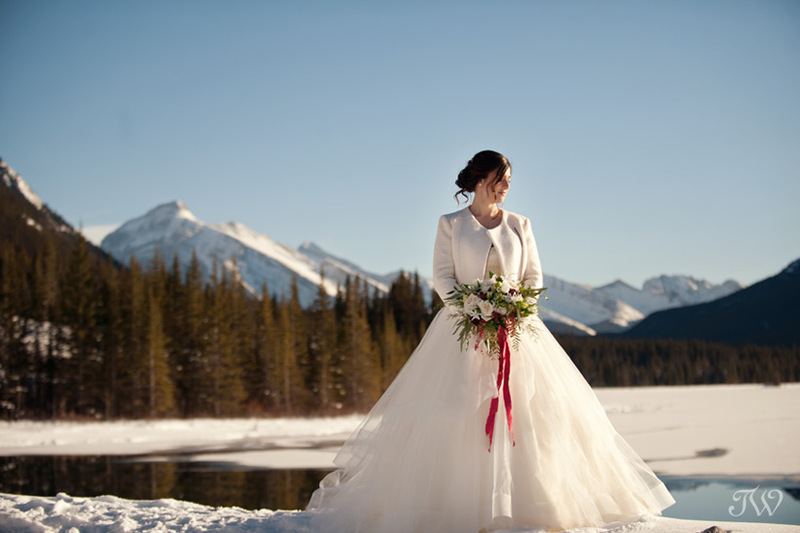 I hope you’ll stop back next week for Part 2, as Janelle gives us more flower suggestions for a winter bride. 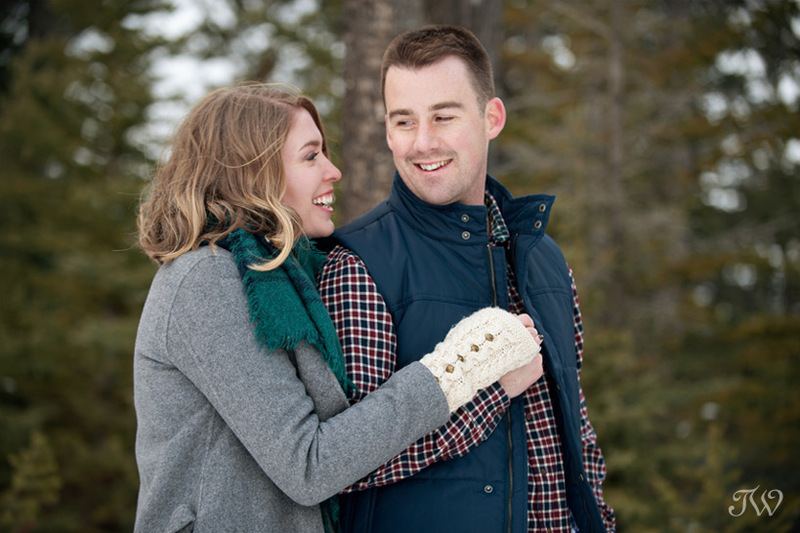 Over the past few weeks, I’ve spent several evenings meeting with my recent couples to reveal their wedding photographs (one of my favorite things btw). As we visit, the topic of Christmas pops up and I learn about their holiday plans and Christmas traditions. Some are travelling to somewhere tropical, others are hosting big family dinners and one couple bought Christmas pajamas for a cozy Christmas Eve together. What an exciting time for them as they celebrate and create new family traditions…traditions that they can continue through the years. 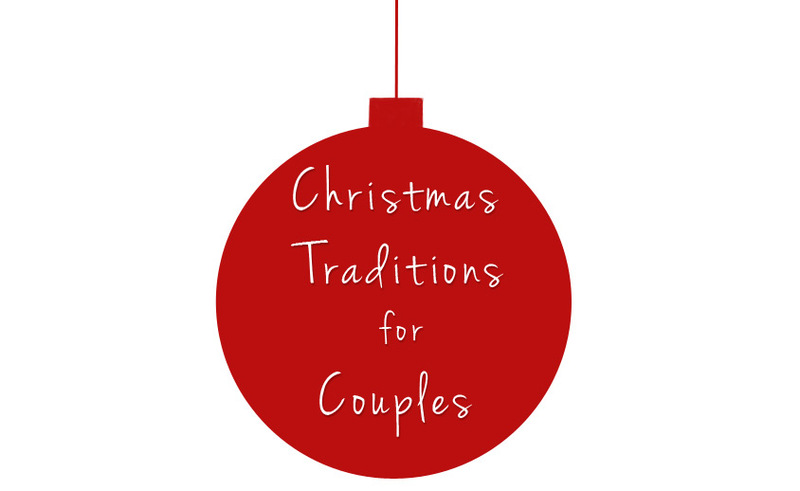 I teamed up with Sharon from Naturally Chic on a series to inspire couples to start their own Christmas traditions and soak in the romance of the holidays. To begin the series, here’s three fun ideas (with a Calgary flare). 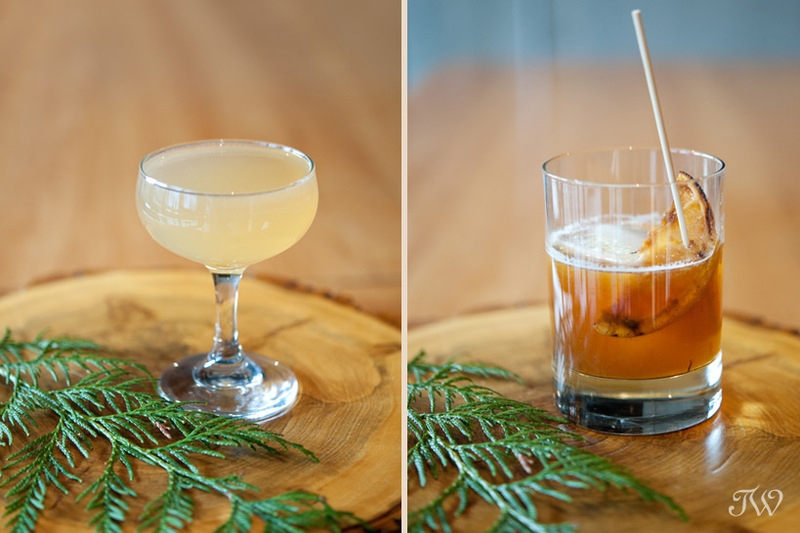 Kick off your evening with a holiday cocktail. The casual yet chic Bar C on 17th Avenue tops our list as the perfect spot to toast the holidays and sample plates designed for sharing. The Burnt Old Fashioned, complete with a toasted orange slice, is my personal favorite beverage. Cheers! 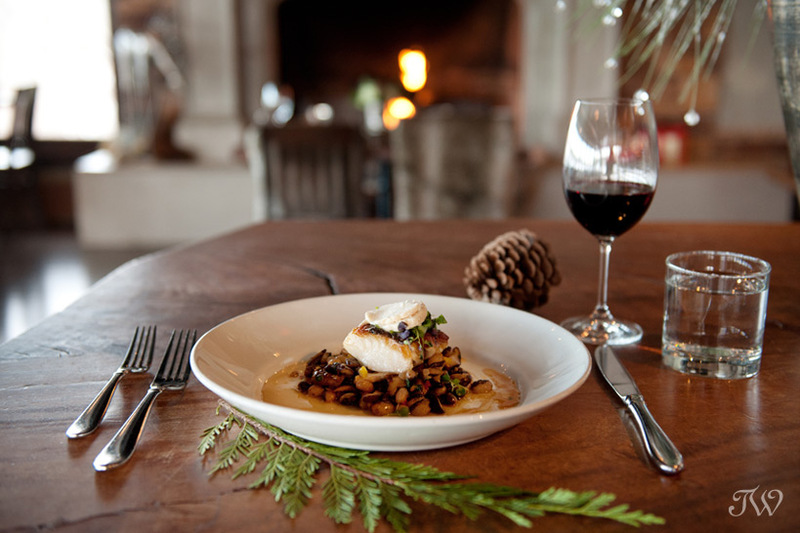 Enjoy an intimate dinner with the one you love. 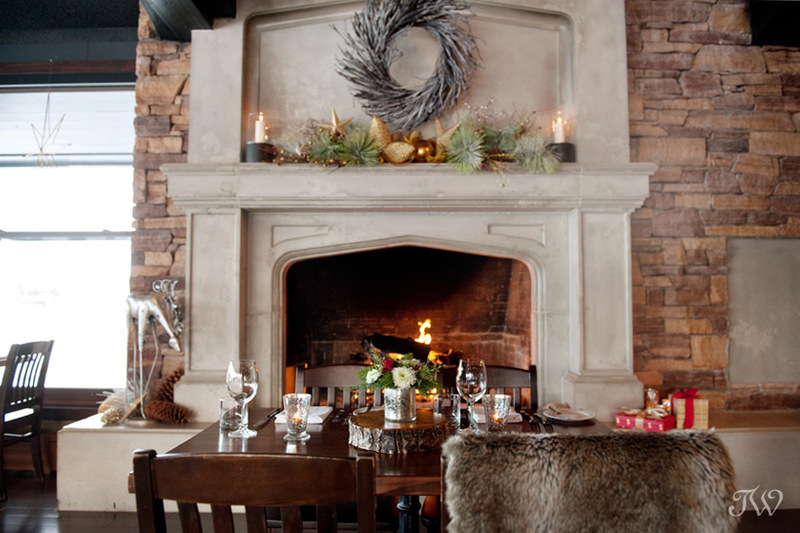 The Lake House is a spectacular setting at any time of year but they have “decked the halls” for Christmas and upped the romance factor. 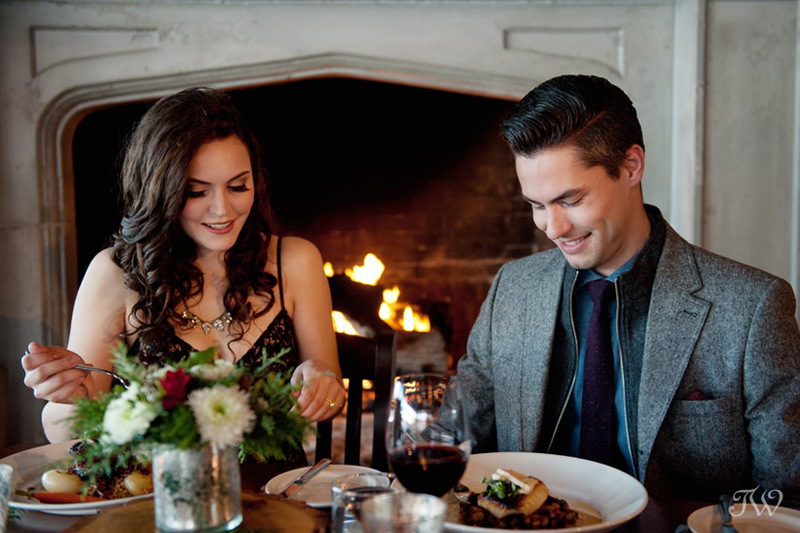 We recommend a dinner for two near the crackling fire in the grand fireplace, while dining on Pan Seared Black Cod or Grilled Alberta Beef Tenderloin (to name a few of their specialties). Complete your experience with a holiday favorite, sticky date pudding topped with honey ginger ice cream. 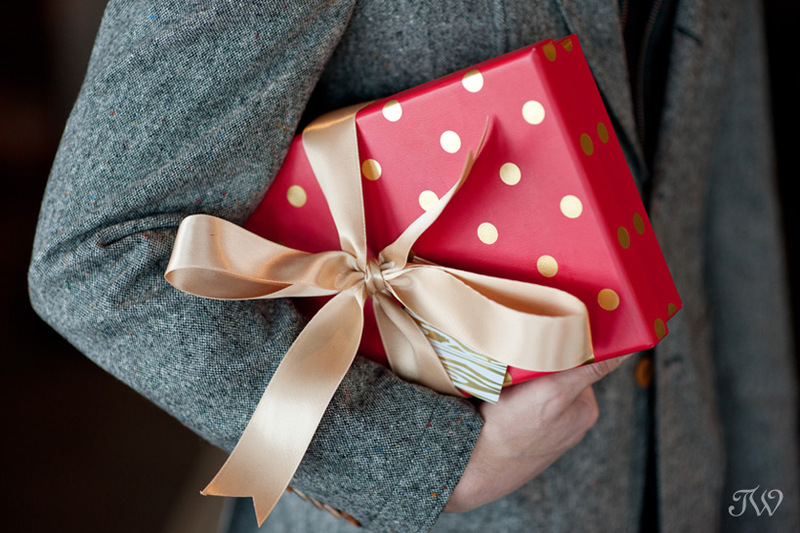 If you’re anything like me, you love watching your loved ones open their gifts as much as you love receiving them. Why wait until Christmas morning? 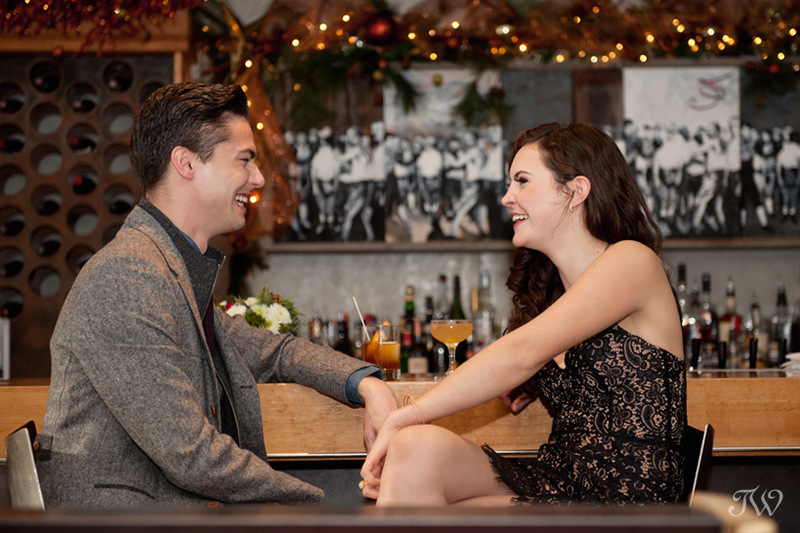 Give your love one small, yet sentimental gift on Christmas Eve and see their face light up. 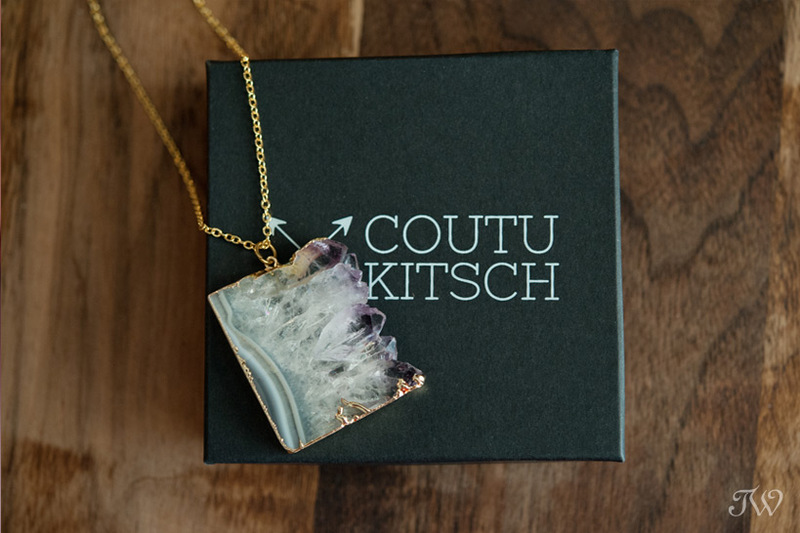 Sometimes the best gifts don’t cost a thing but are thoughtful and handmade. Consider a custom playlist, filled with holiday tunes you both enjoy. 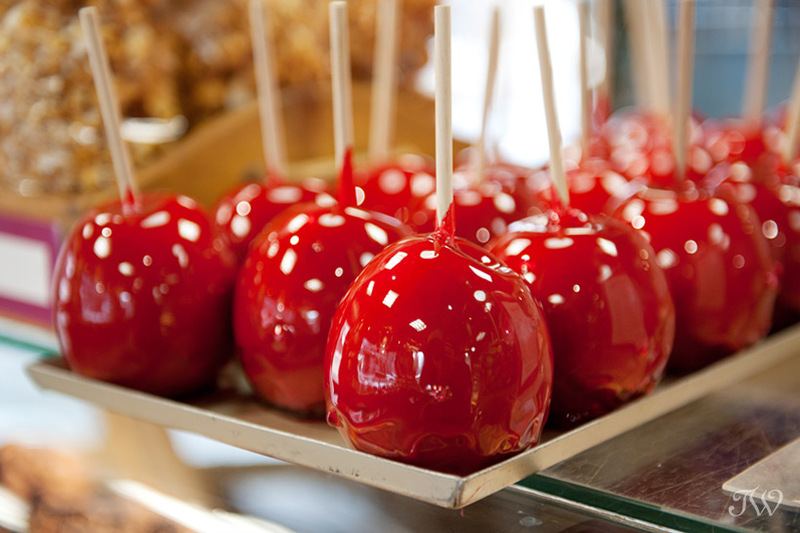 Finish your evening on a high note! 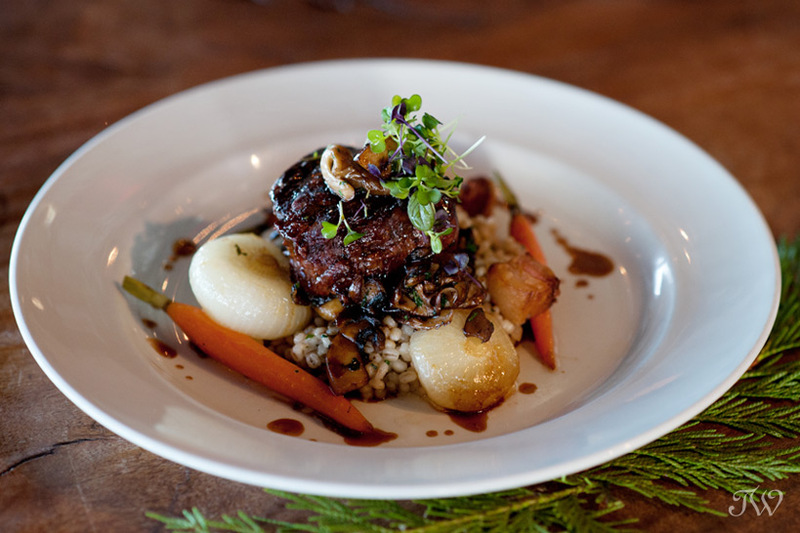 It was a treat to start this series as a guest blogger on Canadian Mountain Chic. 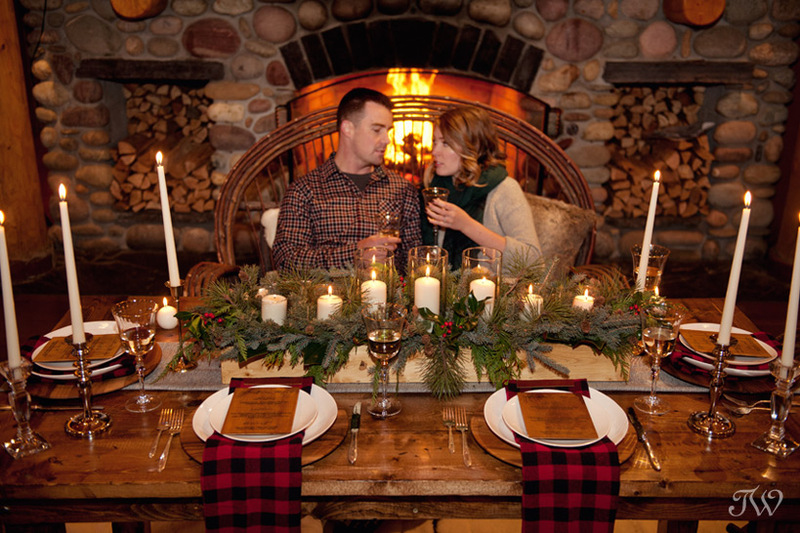 This coming Monday, Canadian Mountain Chic will be featuring Christmas traditions Part 2…mountain style. Be sure to check it out.